Following from the previous post in this three part series, this blog will demonstrate how score-line effected pass direction for teams competing in the 2012 Olympics. As score-line research has typically only investigated pass location and outcome, there are no other studies that can be used for comparison. This is surprising given how important the results of such work could be; for instance if you knew a forthcoming opponent performed more forward passes when losing you might be happy to sit back and allow them possession, as this strategy of theirs may result in them turning the ball over frequently. This blog uses the same sample (2012 Olympic men’s) as the previous blog, but if you want an in-depth explanation of methods, the definitions, and how the statistics were generated, I have produced this here. 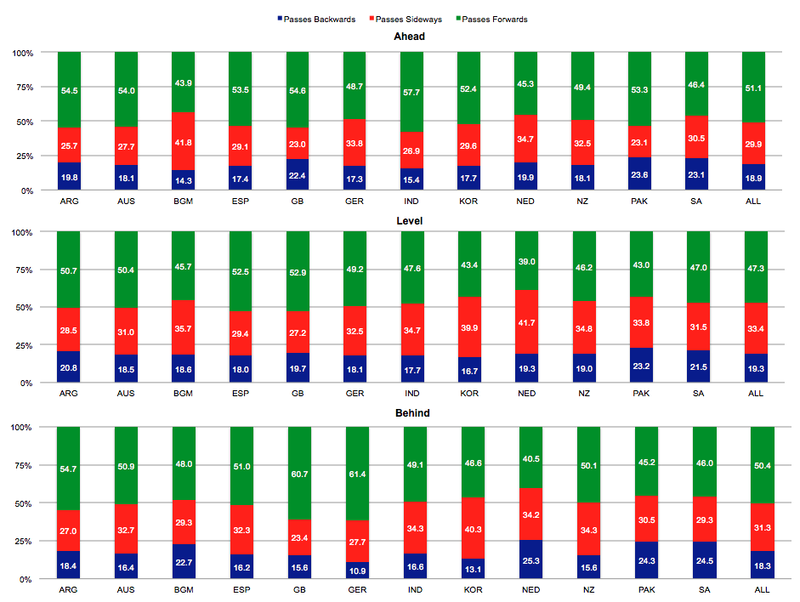 Figure 1 below shows the mean number of passes of each direction under each score-line state. I have highlighted in blue the most interesting finding. That is, teams played a significantly higher % of forwards passes when behind than whenlevel (p < 0.0175), but played a significantly lower (p < 0.0175) % of forwards passes when level than when ahead. This suggests that when behind teams ‘chase the game’, and that they are most cautious when level. It would seem that when ahead then, the % of forwards passes is reflective of a desire to further increase their lead. These are of course speculations, and it may be that all the forward passes occurred in the defensive quarter of the pitch. Nevertheless, they do demonstrate the profound impact that the score-line can have upon passing. Whilst the above findings are undoubtedly of interest in our understanding of hockey, grouping the data may mask individual team strategies. Consequently, I present figure 2, below. Netherlands appear to be particularly cautious, although it could just be that they retain possession much better than most other teams. That said, they did play 59.5% of their passes sideways and backwards when behind, a higher % that any other team. Given their world ranking, this is possibly showing just how confident they are, and that they do not need to force the ball in order to score. This is clearly not a shared thinking amongst top teams, as Germany played 60.7% of their passes forwards when behind, though this could be affected by sample size. Despite the overall finding that teams played significantly more passes when behind than when level, both South Africa and Belgium played a higher % when level – although the differences were minimal. Further, South Africa seemed largely unaffected by the score-line, indicating either an ability to play their preferred style and game plan for the whole game, or an inability to adapt to the changing score-line. In recapping both this, and the previous blog post of this series, I have shown how teams at the 2012 Olympics complete a significantly higher % of passes when level than when behind, and that teams play significantly more forwards passes when ahead and behind than when level. I have also demonstrated the importance of investigating performance on a team-by-team basis – as aggregating data can hide team signatures. The final post in this series will investigate how score-line effected pass location.